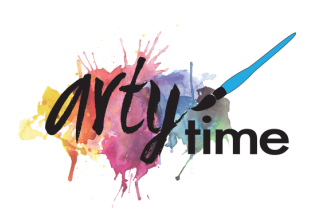 Host Parties: You provide the party, we provide the arty! 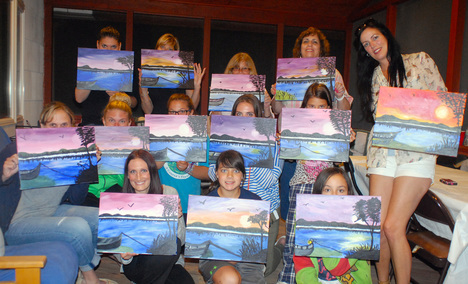 Host a painting party in your home for any occasion! On the date of your event, we come to your home with a preselected painting, art supplies, protection for tables and floors and 2 hour guided instruction. You supply the bevies and appetizers. Artist, Wendy, will instruct the group step-by-step through the painting process. A couple of hours later, you will each have your own masterpieces! $30 per person with a $100 deposit to hold the date and full payment will be collected at the beginning of your party made by cash, check or credit card. Please cancel within 10 days of the event to avoid being charged for the minimum person requirement. There is a require $100 deposit to hold the date. We are unable to give refunds for no shows. Please allow 2 hours for painting time during your party. ﻿"Thank you Wendy. I can't wait to do it again. You are an Inspiration that anyone can paint. It was a great experience for me. You are an awesome and patient teacher." "'There are no mistakes in art' says Wendy. And you have made a believer out of me! Thank you for the confidence and skill. I never knew painting could be so much fun and accomplishing. I'm sold! Thank you, Wendy. You're the best!" No need to leave the comfort of home! Invite friends and family and we’ll come to you. We provide the materials and instruction. 30 minutes before and after needed for set-up and clean-up. Artytime provides a preselected painting to recreate, or feel free to go abstract! 10 days needed for custom paintings. Thank you so much for making my 30th birthday celebration extra special! 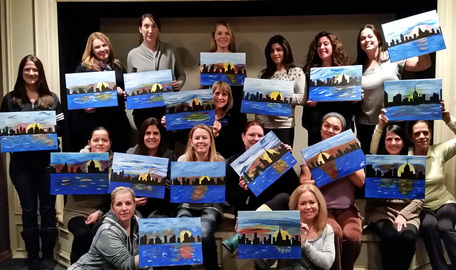 I had an amazing time with my girlfriends and had so much fun painting! You were so great at helping everyone feel like an artist and the extra touches, even your playlist, were fabulous!